Manuals present themselves in all kinds of shapes and sizes: quick start guides, installation manuals, help files in a software application, checklists, online e-learning webpages, instruction videos, augmented reality instructions, reference cards… Manualise can help you setting up any of these manuals – including user manuals of course. 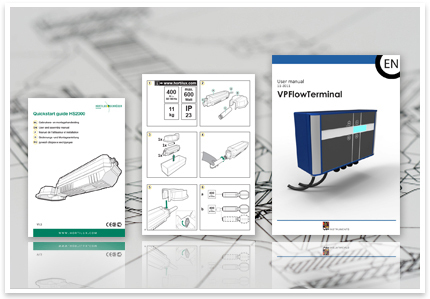 Let us give you some examples of the manuals we have set up sofar. An installation manual is not as much an example of a manual as it is of a checklist. First and foremost, an installation manual should give the buyer the opportunity to check whether he secured his machine or system safely. Are the bolts in the right place? Is the alignment OK? Are all parts connected tight enough? However, an installation manual has not only to do with safety issues, but also with the reliable and cost effective operation of the installation in question. After all, you will not be particularly happy with extra and unnecessary maintenance costs. Manualise has created quite some installation manuals. 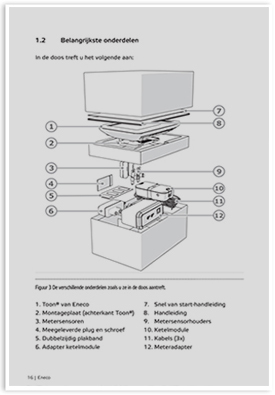 We know what a good installation manual looks like: a lot of clear-cut illustrations, thus drastically reducing the need for a lot of text. In this day and age videos are the main source of information. This is no wonder. After all, people can see before they can read. Also, reading text takes considerably more time than conveying the same message visually. That is why videos are so popular. Manufacturers should therefore carefully consider to provide their buyers with an instruction video instead of a printed manual. There is an added bonus here. It could very well be that the instruction video does not need a voice over, thus eliminating translation costs. Manualise is perfectly happy to discuss all available options. The company can provide you with any example of this very special manual. 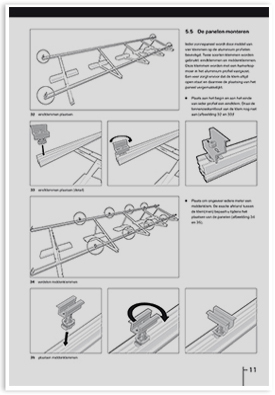 An assembly manual tells you how to assemble a product. Sometimes an installation manual looks like an assembly manual: both tell the buyer how to bring parts of a product together. But there is a big difference between the two: whereas an installation manual concentrates itself on a product that has already been assembled, an assembly manual is meant for products that have to be built up from scratch. A pump as such is already a complete product, it only needs to be secured. A chair from IKEA needs to be assembled. 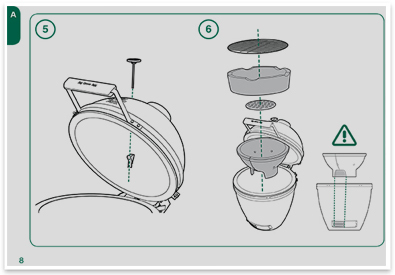 For Big Green Egg, manufacturer of an ‘egg’ representing a completely new cooking experience, Manualise created 24 assembly manuals, all consisting of illustrations only, thus doing away with translation costs. It is the perfect example of a globally used assembly manual. A user manual is the best known manual type – and understandably so, given the amount of ready-to-use products that are around. ‘User manual’ stands for a printed manual, a paper version of a manual roughly the size of a A5 booklet. These user manuals are not only popular because of the variety in ready-to-use products like radios, tv sets or vacuum cleaners. They are also popular because, contrary to general belief, a lot of people are not entirely familiar with the digital world. If one does not own a computer or smartphone, paper is the only available option. Manualise helped a very well-known energy provider in the Netherlands setting up a user manual for an electronic device with which to monitor energy use, thus saving households tens or even hundreds of euros yearly. It is a perfect example of a very popular manual. 3D animations can be a very efficient and effective tool to instruct people how to carry out not too common tasks. Take the following example of what could be dubbed a ‘3D animation manual’. Let us say a mechanic should take out a certain part of a machine to see if it is possible to repair it. If this part would carry a QR code leading to the correct 3D animation, he can decide for himself whether repair would be possible or not. The 3D animation would instruct him what to look for. An animation can leave out certain details, thus stressing what needs to be done and what not. Manualise considers itself to be an expert in leaving out irrelevant details. ‘Augmented reality’ stands for a mixture of video information and artifically supplied information, that is: information that is digitally added to a video to make things even more crystal-clear. An example of an augmented reality manual would be a car in motion while showing the engine pistons running, giving textual information about its performance at the same time. If one of the parameters would be above or below a certain threshold, the digitally presented engine could itself pinpoint to the part that might be responsible for the perfomance lagging behind (or, perhaps, going in overdrive). This kind of 3D animation is very useful when a diagnosis is needed as to which part of the product is causing a (potential) problem. Manualise has special partners who can help setting up any 3D animation. When a product is already very effective by using only a limited amount of basic functions, it is not necessary to scan a complete manual. This is where a quick start guide comes in. A quick start guide, or ‘QSG’ for short, only concentrates on the main functions. The selection of these functions is presented to the user in a clear-cut overview. 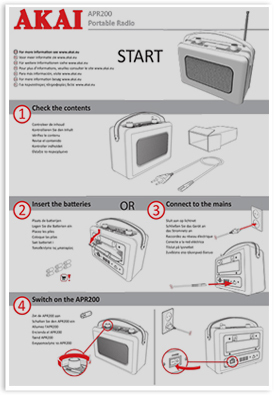 Take a quick start guide for a portable radio or a printer. More often than not, a quick start guide is an A3 folded card or an A4 plastic-coated sheet. Its concise overview is its charm. In essence, a quick start guide is an example of a very short manual, referring to the complete manual if additional information would be required. Manualise is an expert in both, and therefore also in their combination.